Working as a border porter or “kolbar” has turned into a prominent occupation for many in Iran’s western cities bordering Iraq and Turkey. Though it could hardly be called an occupation and is more of an obligation. State media recently published a report on the plight of an Iranian running champion who has been forced to work as a porter to make ends meet. Taha Ghafari who won second place in the Asian Games in Japan and holds several titles at the national level is willing to brave all the risks involved in being porter to make just 160,000 tomans (around $38) for each round. “The conditions are terrible, and I do this to make a living. I carry goods such as clothing five hours a day and get 160,000 tomans for it. Being a porter is very difficult and people die doing it. Sometimes you are 2,500-meters high (in the mountains) while carrying goods. It’s unimaginable how difficult it is,” the young runner said. According to a labor official, the currency fluctuation has a negative effect on porters. 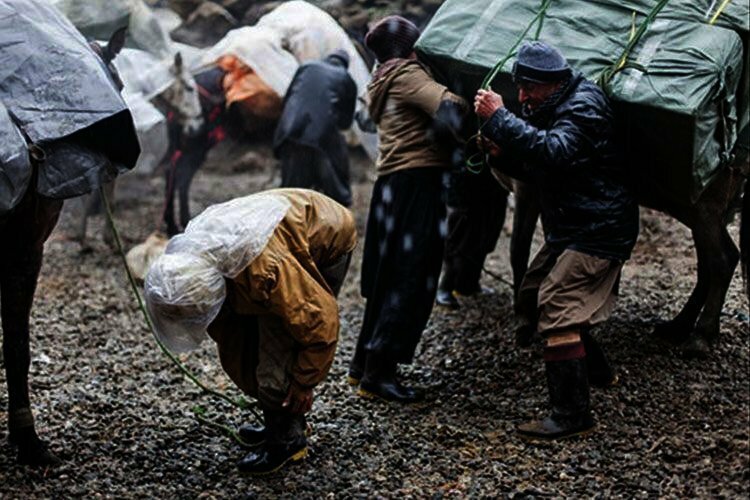 The Head of the Coordination Center of Islamic Labor Councils in Kurdistan said that the livelihood of porters had taken a downward turn as a result of the severe fluctuations in the currency market. “Porters do not carry goods for themselves and are only middlemen. This means they bring the goods for third parties and receive money,” Shaker Ibrahimi said explaining their situation. “When the currency rate increases, the goods that they carry no longer has any buyers. In other words, there are no customers for foreign goods. Instead they carry the goods from one border to another. Food and clothing goes from Iran to Iraq. People from Iraqi Kurdistan come to Iran’s border towns and buy goods and either sell them in Iraq or use it for personal consumption”, the labor official added. Iran says that porters are smugglers and therefore border guards frequently open fire on them which has in many instances led to their deaths. The most recent case was 17-year-old Vahid Dolatkhah. Dolatkhah died on August 21 near the border with Turkey due to an “unnatural accident,” according to ILNA. Human rights source however say that Dolatkhah was shot in the chest and stomach by Iranian border guards while carrying smuggled cigarettes. Hundreds of porters have been killed or injured in past years, according to reports by rights groups. Some have been shot by security forces and border guards; others have died after being caught up in natural disasters, stepping on land mines that remain from the 1980-1988 war with Iraq, or falling from mountains. Human rights sources also say that only in the past month, 15 porters were sentenced to prison.